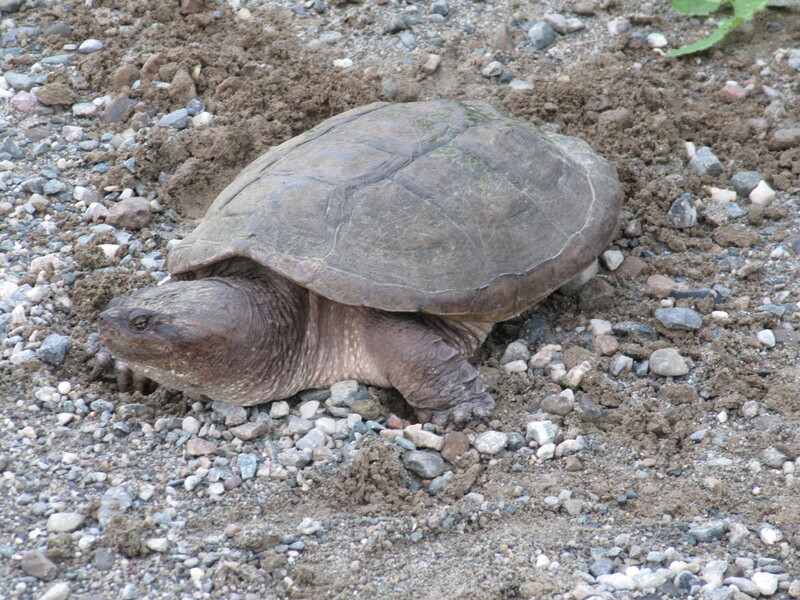 This snapping turtle was laying eggs a few days ago. Good for you, turtle. Procreate! I’m all for those cute little buggers popping out of the sand and wiggling their way toward a new life trying to avoid things like raccoons and crows, who only want to eat them for breakfast. This turtle, however, was depositing its potential offspring right on the side of the road. Cars are whizzing by and its just hanging out there, popping out unformed youngsters. Honestly, I’m not sure why turtles have been around for millions of years, or why they live to be, like, 100. Granted, we have pretty much destroyed any hope of any other creatures, aside from the ones we eat, surviving at all on this mess of a planet, but come on, turtle, how about my driveway at least? Those speeding high schoolers won’t slow down for you if they don’t slow down for the rain soaked muddy turn. That most humans don’t live to be 100 makes sense to me. I’ll have to watch out for those little guys in however long it takes for snapping turtle eggs to hatch. I’ll even move them to safer locales, too, as long as it isn’t when school gets out. I can’t say that I have had an easy time each morning I have risen to get a run in. Take this morning, for example. I was tired and fuzzy and hungry when I finally got out of bed, and let me tell you that was not quick process. It was dark. Clouds covered the early light and the half moon high in the sky. It was windy. I shuffled out of bed and changed into running duds. The temperature was 52 and thought, did I read that right? It was warm. So I put on shorts and long sleeves and slapped on a headlamp and a reflector vest and out I went. My friend Pat, who is a fast enough runner to win now and again, once said to me, when I asked him how he keeps up the training pace, “There are many days when I just do not want to go for a run, but every time I do, I have a great experience.” What he meant was this: it may be hard to get started, but once you do get started, you won’t regret it. That is pretty much spot on. Today was one of those days. Since it was dark, and the windows on the house are closed these days, I was imagining how cold it was going to be. It is November, and most dark mornings are cold. I recently ran when the temperature was in the 20’s. This morning, however, was what you might call pleasant. I had to use my headlamp for a bit. Cars and potholes make me cautious. But much of the way I ran in the almost-dark. It is a bit surreal at times to run when the wind blows and you can’t quite see what lies at the roadside–is that the shadow of a stump or a skunk?–and it is only you and your feet and your breathing and the road ahead. I love that. A warm morning helps. I stopped for a couple minutes on the bridge over the river, to listen and to look at the shadowed water. It was, to use a word many shiver to utter, lovely. I will keep doing it, this rising early to run. Some days I will go farther than others. Some days I will hop up eager to pull in some miles. Some mornings I will rise because I know I will be happy I do so even though I just don’t want to in that moment. But I rarely wish I hadn’t gotten up early to run. Only a couple of times have I been too preoccupied with my mental detritus that I would have been better off staying in bed for a while longer. But then again, I probably wouldn’t have slept anyway. In the end, I might as well just get up and go. I am still wrangling with a bad cough and a bit a stuffed head. I look forward to that passing so I have a little more energy when I get out there in the wee hours, even if I haven’t had breakfast yet. Breakfast, by the way, tastes pretty good once you’ve already been outside for an hour or so. And who doesn’t like a good breakfast? I sit at the table, my mind clear and my muscles feeling good, and I look out at the view and look forward to the day. It may be hard to get up some days, but the time is well spent. Driving home on this beautiful spring evening I saw a turkey prancing its way across our neighbor’s exquisitely mowed lawn. It made me wonder if any turkeys were at our place. They haven’t been around much these days. I was afraid they would eat the freshly planted peas. Didn’t happen and I’m glad of it. After I passed the trotting bird I looked across the field on the other side of the road. I could see all the way to the river to where the one lane bridge crosses it. Along the road I saw some dark objects. Having just seen a turkey, the first thing I imagined was that those dark objects must be turkeys. Except they were perfectly lined up, tucked into the side of the road. And they were perfectly round. Not turkeys. It turns out they were culverts, which I figured out just by letting my brain get over its immediate assumptions. Haste makes waste there, Brain! Trucks have been in and out the past few days hauling dirt and gravel and all kinds of other stuff, like long steel corrugated tubes. Next to the bridge, where the road sometimes floods, the town crew raised the road and tucked culverts underneath to let the water flow. Smart. Next month I will plant corn. Last year the turkeys pulled it all up. Twice. Once I plant again I bet they will come back around. They figure these things out. Call them turkeys if you will but they are crafty bastards. Smart. They will be back to get my corn again. You can bet on that. Unless they are too distracted by the culverts to remember. Could happen. But I won’t plan on it. We did have a snow day after all today. This meant I had more flexibility in my schedule than I had planned, so I went for a run mid-morning. The snow had let up, but started again after I left the house. It was slippery but things started off well. I ran down Leavensworth Road. Two cars (two!) passed me before I got to the section that is not plowed. Then it got interesting. I was doing that thing that dogs do when they come outside and don’t know about snow, picking their feet up high and looking ridiculous. I had to step high. I have run in snow before and usually I find it fun, but we got a crust of ice, a thin one but a crust, between layers of snow. It cut my ankles. I took it for a while, tried to be tough, then realized that this was silly. Why hurt myself while getting wet in the falling snow? So I turned back and ran down O’Neil Road, plowed the length of it. That was fine, except by then the snow had turned to sleet. It slapped me in the cheeks, except the little grains were so tiny it felt like it was biting me rather than slapping me. I took that for a while too but turned back again. By now I was laughing out loud–for real–the situation was so absurd. Why do I do this? I asked myself. Oh yeah, it’s fun. It was snow falling again by the time I returned home. I appreciated the warm fire all the more when I got inside. Of course, I had to shovel a bit before I went in. That made me laugh as well. Ah, snow. How can I help but laugh?